Japan Ministry of Transport has launched an overhaul of the aviation industry’s lax alcohol testing standards after an intoxicated co-pilot attempted to board an international flight in London. The embarrassing incident not only made worldwide headlines but exposed the lack of legal frameworks regulating Japan’s aviation industry’s drinking policies. In late October, a Japanese Airlines (JAL) co-pilot evaded detection from a preflight alcohol test prior to boarding a London-to-Tokyo flight and was later arrested for exceeding the country’s legal limit by 10 times. Katsutoshi Jitsukawa, 42, confessed to drinking two bottles of wine and 1.8 liters of beer after 6pm the night before the flight. Authorities were alerted at Heathrow airport when a bus driver transporting the crew to the plane noticed the smell of alcohol. Jitsukawa pleaded guilty in a British court and was sentenced to a 10 month jail term last week. Under Japanese law, alcohol consumption is banned eight hours before taking duty and JAL policy specifically sets a 12 hour drinking ban before starting work. But under the current system, airlines are free to create their own internal rules and voluntarily impose alcohol breath tests. Meanwhile, no industry-wide legal blood alcohol level has been enforced and no standard alcohol consumption rules between pilots, crew members, and engineers exist. Until recently, JAL allowed pilots to cross check each other’s alcohol breathalyzer readings. But the system was phased out domestically when digital alcohol breath tests that log results online were rolled out in August 2017. However, overseas offices such as the one at Heathrow airport have not yet been fitted with the new device, and instead rely on basic blow-in breath detectors. In the lead up to Jitsukawa’s arrest, the company’s breath testing equipment did not detect any abnormality, which the two on-duty pilots reiterated in their testimony. But it’s possible Jitsukawa blew into the device incorrectly or fellow pilots turned a blind eye to the alcohol breath test results. The Transport Ministry’s inspection of JAL uncovered 19 failed alcohol breath tests since August 2017, causing 12 delayed flights. Between seven airlines, the Transport Ministry also detected 37 instances of pilots arriving to work under the influence of alcohol since 2013. When JAL’s new digitized data collection system was inspected, some 3,800 alcohol test results were missing from the 220,000 already collected, which was explained as stemming from staff ID typing errors and system installation failures. This alarming trend not only reflects a dangerously lax company attitude but raises the concern that a pilot’s sobriety before takeoff cannot be guaranteed. 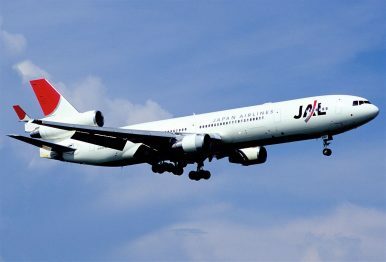 JAL also admitted to occasions where prolonged preflight meetings prevented pilots from taking an alcohol breath test altogether but stressed this occurred only in a handful of incidents. JAL President Yuji Akasaka apologized at a press conference, saying he takes full responsibility for the incident and vowed to take a 20 percent salary cut. Last Tuesday, the heads of 25 top domestic airline carriers were called to a meeting with the Transport Ministry in a bid to address escalating pilot drinking scandals with mutually agreed countermeasures. The focus was recurrence prevention measures by first setting a uniform numerical blood alcohol limit. JAL has temporarily extended its drinking ban from 12 hours to 24 hours while a new policy is finalized, which also mulls penalizing pilots who fail alcohol tests. All Nippon Airways (ANA) proposed more accurate and portable alcohol testing equipment to be distributed among flight crew and alcohol detection training. ANA and Skymark Airlines have also been embroiled in alcohol related delays this year. In late October, five ANA domestic flights were delayed in Okinawa when a pilot was too hungover to come to work. Meanwhile, in mid-November an American pilot for Skymark Airlines was reprimanded at Tokyo’s Haneda airport for failing a breathalyzer test before boarding a flight to Sapporo.